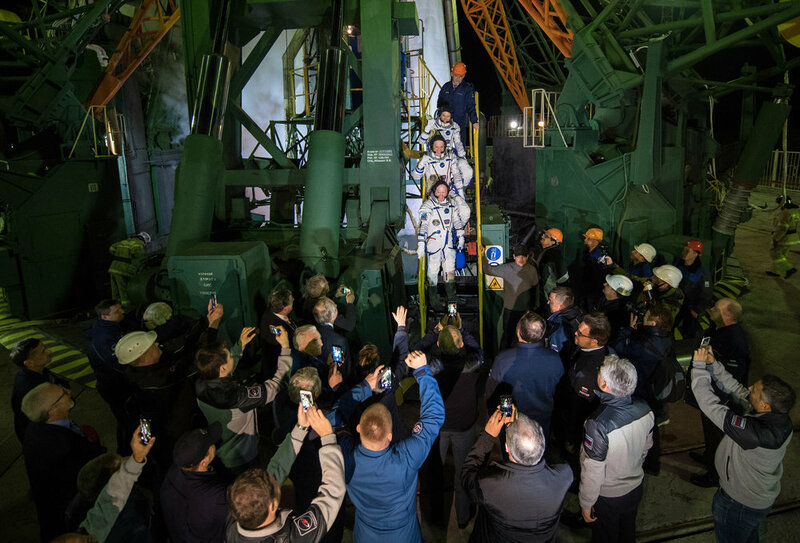 Once there, the rocket was lifted into the vertical position and umbilicals connected to begin the process of readying the 49.5-meter tall machine for its launch. Soyuz MS-08, call sign “Hawaii,” is part of the latest evolution of the spacecraft (Soyuz-MS) that dates back to its first launch in 1967. It consists of three modules—an orbital module, descent module (where the crew resides), and a service module—totaling 7.78 meters long and 2.72 meters wide. With its solar panels deployed, it has a wingspan of 10.7 meters. During their two-day journey, the crew will have a tiny volume of 10.5 cubic meters to live in between the orbital and decent modules. 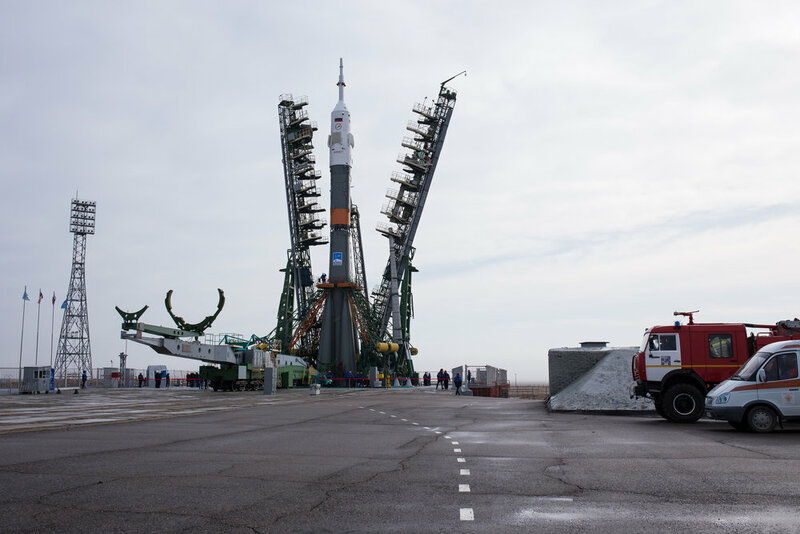 The Soyuz-FG carrier rocket has three stages, which includes its four strap-on liquid-fueled boosters as the first stage. Those boosters are 19.6 meters tall and 2.68 meters wide. Each sport a single RD-107A engine that consumes liquid oxygen and rocket grade kerosene to produce 838.5 kilonewtons of thrust for 118 seconds before falling away. Stage two includes the 27.1-meter tall, 2.95-meter wide core stage. It is powered by a single RD-108A engine, which also consumes liquid oxygen and rocket grade kerosene. It fires at the same time as the boosters and produces 792.5 kilonewtons of thrust for about 280 seconds. The third stage is 6.7 meters long and 2.66 meters wide. It is powered by an RD-0110 engine and consumes liquid oxygen and rocket grade kerosene to produce 298 kilonewtons of thrust. It fires for up to 230 seconds to push the Soyuz spacecraft into orbit.